News headlines and market commentary have been overwhelmed by discussions about the notable increase in market volatility, especially over the last several months of 2018. But we must remember that in 2017, volatility was exceptionally low. In our view, 2018 marked a return to more normal levels. Nevertheless, we currently do not see any systemic deterioration in the market fundamentals. As such, recent market action is very different from the previous major selloffs, including that of 2008. The recent return of “normal” volatility is not surprising given factors including fear of a slowing economy, US-China trade tensions, political uncertainty and market trading dynamics. Among these, political uncertainty, including the recent US government shutdown, should not be underestimated when it comes to volatility in the markets. Even absent a true financial impact, the uncertainty and resulting investor sentiment can create headwinds for the financial markets. At issue is how functional the divided US government will be over the next two years and whether it can effectively handle an unexpected crisis. 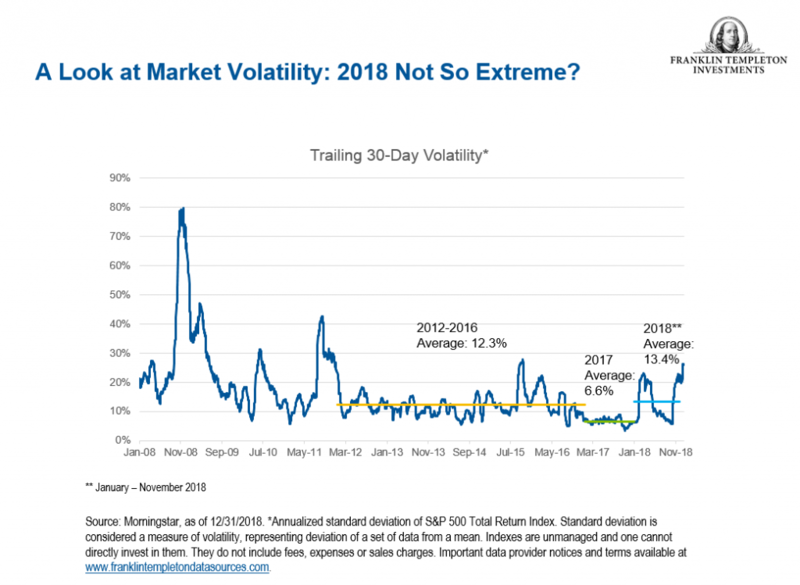 Additionally, the increased influence of computerized trading and quant models that trade based on data patterns versus company fundamentals likely created especially exaggerated market moves at the end of 2018, which made December an extreme outlier compared to “normal” volatility. In terms of the economic outlook, we are actively watching for signs of a slowing US economy. In December, the US Federal Reserve (Fed) cut its estimate for 2019 US gross domestic product growth to 2.3%, down from its prior projection in September of 2.5% and from the nearly 3% growth realized in 2018. The December ISM Manufacturing PMI, a common gauge of industrial activity, recorded its lowest level since the end of 2016. At the same time, the residual tax-cut benefit that supported US growth in 2018 is likely to continue to wane over the coming year. Offsetting these elements are pockets of positive news and data, most recent being the stronger-than-expected US jobs report. This uncertainty in the economy’s path forward is resulting in a more data-dependent Fed, which is coming off four well-anticipated interest-rate hikes in 2018. That, combined with the ongoing unwinding of the Fed’s balance sheet, will likely underpin continued volatility in the months ahead. Even with this backdrop, we do not see any broad-based weakness in the corporate fundamentals, nor do we foresee a transition into a recessionary environment in the near term. Overall, we see room for continued earnings growth and potentially more favorable equity returns, albeit arguably not until several months into the year when the sentiment focuses away from the political turmoil and gives more credence to sustainable fundamentals. At the sector level, we believe financials may warrant a stronger consideration. Banks have faced outsized pressure amid the potential pause of the Fed’s hiking cycle; however, healthy balance sheets and earnings growth may make them a more attractive buy, especially after incorporating name selection. On the flip side, there are some sectors that call for more caution, most notably energy as it deals with the uncertainty of oil prices going forward. While volatility can be difficult to endure as an investor, it can also create opportunities. Ultimately, we view the changing environment as an opportunity to adjust portfolios and potentially add new investments. Market volatility plays nicely into our bottom-up investment approach and use of active management to uncover compelling opportunities for our portfolios.